As the prospect card market expands, so too seems to be the number of product offerings. Borrowing from some of the more popular elements of the Bowman Chrome line, 2011 Leaf Metal Draft Baseball includes nearly 50 low-round draft picks. All are featured with on-card autographs, including some familiar sounding parallels: Blue Prismatic, Red Prismatic and Super Prismatic. 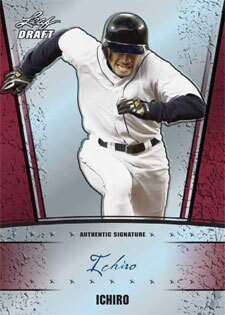 Metal Draft marks the first Leaf set to include Ichiro Suzuki signatures. The Japanese star hasn't had an autographed baseball card in several years. Each pack has six autographs. All cards feature on-card signatures. The checklist consists of nearly 50 top MLB draft picks. Leaf recently signed a deal with Mariners superstar, Ichiro Suzuki. This is the first Leaf set to include his autographs. Serial-numbered parallels: Blue Prismatic, Red Prismatic and Super Prismatic. 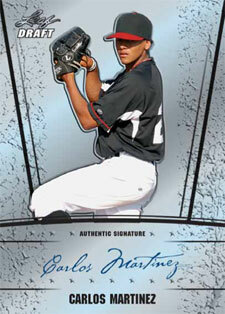 2011 Leaf Metal Draft Baseball short prints. These may not be out yet but I’ve seen the football set. They look like a 1993 Ultra insert and Royal Rookies set had a child. I dare a card company to make a more unattractive card. It can’t be done! 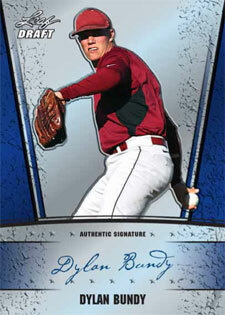 There are 72 on card autos per case – you won’t find that anywhere else at this price point! Plus, the final checklist adds some stellar names. I don’t really like the design a whole lot either, but some of these cards, like Spangenberger, is selling on E-bay at $99. That, and as Houdini said, a plethora of on-card autos. I am rating a 4, in order to offset the very first review by Kubbie23, which was beyond unfair. I think the product deserves at least 3 stars. I am entirely confused how you rate a baseball product that you haven’t even seen yet, based on a football product that you have. Doesn’t make sense. Card manufacturers rarely, if ever, have the exact same design between two different sports, even of the same year, that they happen to cover. That, and the design isn’t completely terrible. I would rate it as a 2 or 2.5 out of 5. The subjects more than make up for it, though. I’ll take the mundane design with the almost always near-flawless card and its on-card autograph over a fancy card from Panini with its sticker auto slapped over it. Leaf is basically all we have for competition-if that’s what you’d call what Leaf isn’t allowed to do-vs. Panini.